A Problem Bear! How dare Uli?!? And also, what is a Problem Bear? It sounds like quite a euphemism. However, it’s simply German and almost transcendently literal: a problem bear is a bear that creates problems. Specifically, Bear JJ1, aka Bruno, aka Beppo, aka Petzi. Yes, all this info is from wikipedia. The first brown bear on German soil in 170 years (this was 2006), and the killer of a guinea pig among other contemporary German beasts, like sheep. 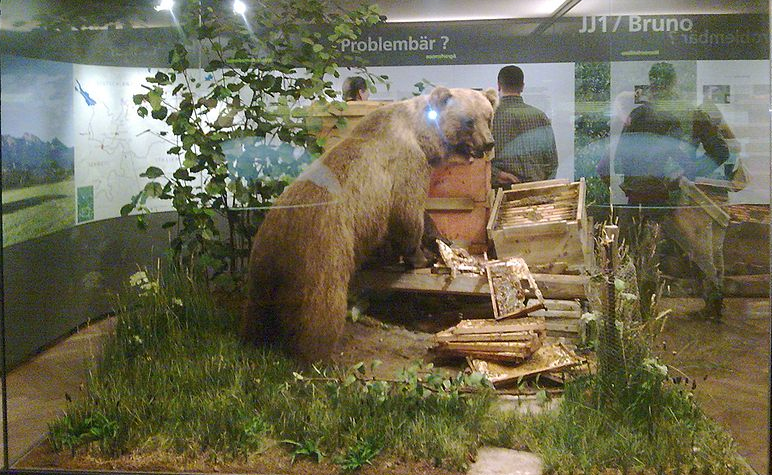 The Problem Bear was eventually shot dead after wrecking meek havoc, which is really more indicative of a German Bear Problem (ie they really should have more bears, as bears are wonderful, and would make Germany tougher) rather than the existence of a true Problem Bear. Since Bruno’s demise, the word “Problembär” has apparently become something Germans call troublemakers of multiple stripes. Stirrers of the pot. Guinea pig slayers. Folks that flit from one situation to another, causing strife in each. Unnecessary rufflers of feathers. Zlatans. This made me think: is Jose Mourinho a Problembär? I would say yes, but I’ve just decided to withhold personal usage of the term from anyone or anything I find consistently obnoxious. I’ve decided that the Problembär, in my sphere, isn’t so unbearably bitchy. Here is Mourinho storming out of a pregame press conference because he was annoyed by a “why isn’t x on your team sheet” question. If the situation were taken totally seriously, one would have to ask some basic questions, like why do we have these press conferences? what on earth does anyone really hope to learn from this? isn’t this just about one game, plans for which the coach will reveal as little as possible? and the game doesn’t even happen today, but tomorrow? how bored, exactly, are these poor reporters? why doesn’t everyone storm out? why do we watch television? But let’s skip the real questions, and continue on with the inane and the whimsical. The hubbub over team selection is of course related to Mourinho’s shunning of Juan Mata. For those of you that don’t obsessively follow the EPL, Mourinho has used Mata as a sub in league games and omitted him entirely from the squad against the derby game with Fulham. Mata has been Chelsea’s best player for the past two years, and is a fan favorite. Here‘s Michael Cox’s take, written before the Tottenham match. It’s a situation that’s been brewing since Mourinho was announced as Chelsea’s next coach- I recall Mata was asked how he felt about his new coach, and in stark contrast to the enthusiasm of his team mates, he said that he’d wait and see. That was at the end of last season. The summer passed, Mata was not sold, the new season began, and he’s now second string. While there’s nothing wrong with a coach having preferences contrary to public opinion, or being ruthless with egos, I think the scenario illustrates the ludicrous misbalance in finances in the sport. Here’s a guy Chelsea could have sold to a another team, in another league, for at least £35M. A guy the coach doesn’t rate. Instead, they keep him because they can, and because it weakens potential competitors- foreign competitors who they most likely will not play. The situation is the same with David Luiz, also omitted from the Fulham game, also in demand, and also worth an incredible amount of money. Similar is true with Lukaku, an incredible player who they’ve sent out on loan again, because they won’t make room for him in their squad, but can’t be moved to make what would be a necessary economic choice at most other clubs. Demba Ba isn’t a superstar, but he isn’t playing, and could’ve been sold as well. Chelsea sits on these players because they can. It’s no good for the players, it’s no good for spectators, it’s economically nuts, but the financial rules are so weak coaches like Mourinho can make strategic decisions at tremendous cost that only marginally add value to their team. He does that, and then he can spend £30M on Willian (possibly just so Tottenham couldn’t have him), and then bench him, too. There’s no real genius in any of this, only mega-luxurious spite. The game would be more interesting, and managers like Mourinho less vaunted, if this sort of business wasn’t allowed. Zlatan is a Problembär. Mourinho is just a headache.